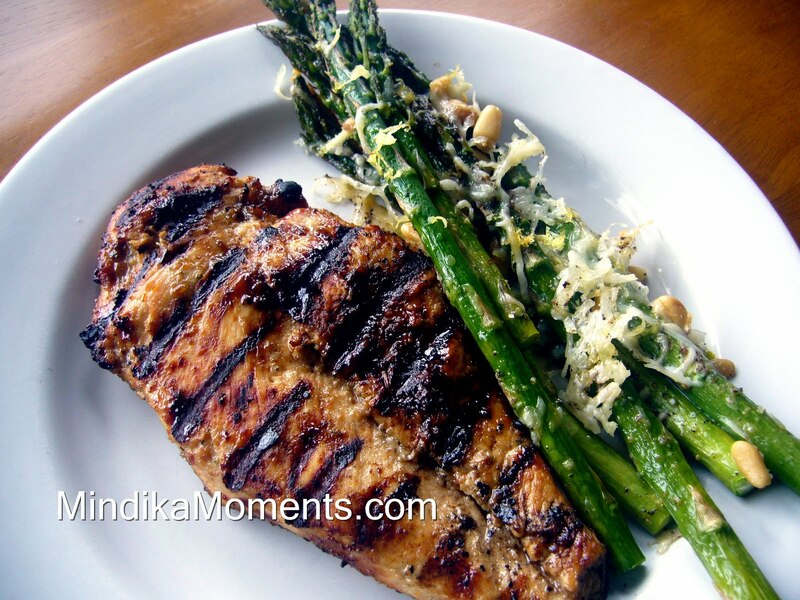 Mindika Moments: Grilling days are here again! Grilling days are here again! Oh halalua the sun is shining today. I haven't been outside, so I'm not sure how warm it is...but I love to see the sun shining. We've been having such cold and dreary days here in Utah, and although I appreciate the moisture that comes with rain and snow...I love love love the shining sun. It's supposed to get warmer and even nicer as the week progresses, so you know what that means?? It means we will be grilling! I love to grill and although I grill all year long, rain, snow or shine...grilling on a sunny blue sky day is so much more fun. If the weather is nice where you are, here's an idea for a marinated grilled chicken that I promise you will love! I served this with Lemon Roasted Asparagus! 1. In your blender or food processor, combine all of the ingredients, except the chicken. Blend or process well. 2. Place the chicken in a large zip lock bag. Pour the marinade over the chicken, zip up the bag and place in the refrigerator to marinate over night or several hours. 3. Grill chicken as you normally would, basting several times with the marinade. 4. Serves 4 to 6 persons, depending on the amount of chicken you use.